Ayurveda breakfast: Start your day with colors and spices! I am so in love with my Ayurveda breakfast. Warm, colorful and with the power of spices boosts my mood and metabolism. Balance and Yoga happens also on your dish. How to bring balance in your kitchen and your breakfast plate you learn today. I share with you the basic recipe for my Ayurvedic breakfast porridge. Plus: It’s vegan and low carb (Logi-Diet)! Enjoy! 1. Put coconut oil or ghee in a pan or a pot. Add turmeric powder cinnamon and cardamom. 2. Add oats and flax seed and stir all together on low heat. 3. Cut the apple in small cubes and add them to the other ingredients in the pot. Heat up and fry them for a moment. 4. Before the content roasts, deglaze everything with water. Let it cook for several minutes (so flaxseeds and oats can soak). 5. Cut the banana into fine slices and add them to the rest in the pot. Cut the ginger into tiny cubes and add them to your porridge. Stir everything and let it rest. I love the strong taste of ginger. That’s why I add it at the end, so it starts cooking only with the heat of the porridge. If you prefer it less spicy and softer ginger taste, simply add the ginger at the beginning and fry it with the other spices. That’s my basic recipe for a vegan Ayurveda porridge. You can also do it with milk/vegan milk. Instead of heating up you keep the ingredients on lower heat, add the milk and let it simmer while you stir from time to time. 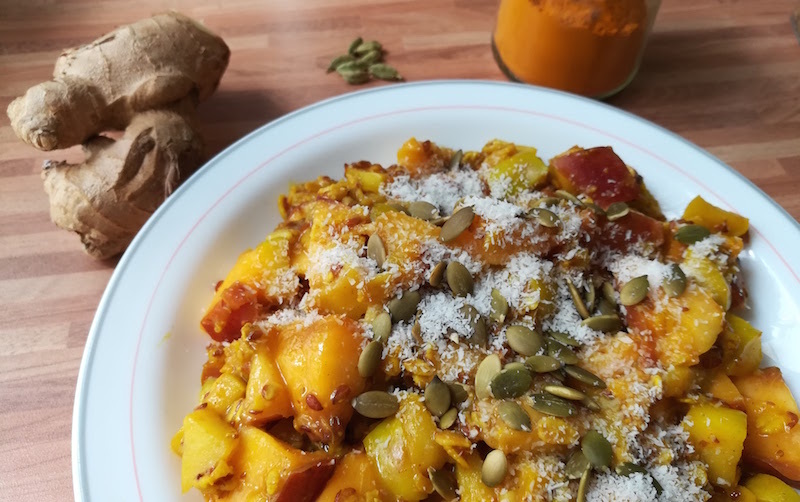 Ayurvedic porridge bowls are so amazing because you can make them different everyday. Be creative and experiment. With Quinoa: Instead of oats you can make it with quinoa (then cook quinoa first). 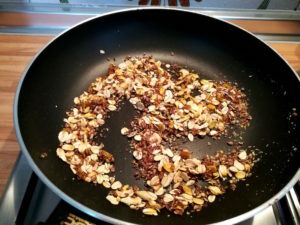 Almonds: cut them into pieces/slices and add them at the beginning to the spices (like oats), so they can soak and vitalize. Walnuts: You can add them to the ready made, warm porridge or on top. Now you have your porridge base (+variations). I love to make a topping for my Ayurveda porridge. What makes this porridge an Ayurveda breakfast? The spices! In the basic recipe we add cinnamon, ginger, cardamom. But there’s so much more you can play with: Try vanilla, black pepper or cloves powder. Do it by yourself. And don’t be scared of experimenting and trying new combinations of fruits, nuts and spices. Find your personal favorite! Have fun and enjoy life! Because also in food it’s all about: Love. Heal. Connect.